March 29, 2007: Sunny and cold, water temp 57*. With a major cold front blowing through last night I knew fishing would be tough today. We started out pulling the same areas that I caught fish on the previous days but all we could do is get short strikes. I pulled up onto one point and had 6 hits in 10 yards, only one of the fish hooking up. We tried several other areas today with the same luck. 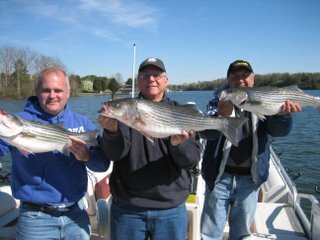 Clients ended up catching 4 Stripers, 2 Cats, a Bass and a White Perch.